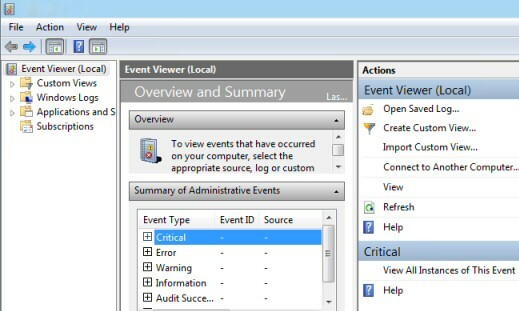 The Windows 8 Event Viewer provides a marvellous interface to investigate critical and error messages in the logs. You can examine not only the System and Application logs, but also Hardware Events and records of activity from IE and other programs. I like to press Winkey +w, because this launches the Search box, and crucially, the focus is on Settings (rather than Apps). Now type: "ev" you should see ‘View event logs’. The biggest change Microsoft made to the Event Viewer came between XP and Vista with the introduction of the three pane interface. Windows 7, and now Windows 8 have merely refined the interface and extended the range of logs that you can interrogate. If you just want a quick ‘Health Check’ then start with the central ‘Overview and Summary’ pane, I suggest you work your way through the Critical messages followed by the Error messages. As the title indicates this is where you will find a list of important events collected from all the computer’s logs, the benefit is that you can work your way through the red dots quickly. Alternatively, you could focus on the left pane and drill-down through a particular Windows log such as Windows Logs –> Application. If you want to view the logs on another computer than there is a link on the ‘Actions’ pane. 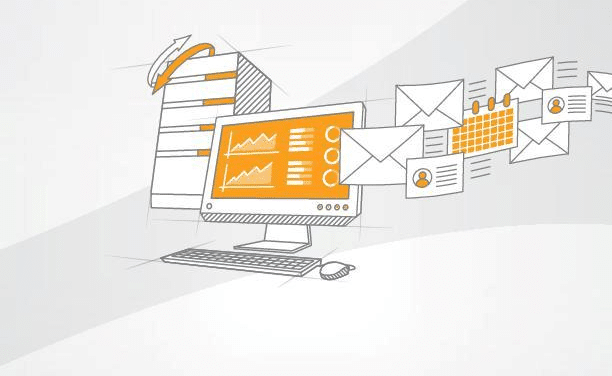 In amongst the traditional Application, Security and System, are two extra logs, Setup and Forwarded Events. 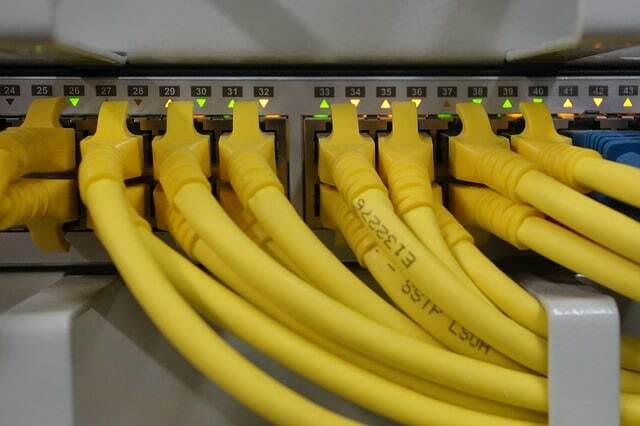 As you add new programs so the Setup log records events relating to the installation, which can be invaluable in troubleshooting what went wrong. The ‘Forwarded Events’ log is used to collect events on other computers, you can specify the details via the Subscriptions menu. (See bottom left of above screenshot). 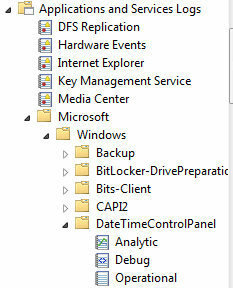 The	Windows 8 Event Viewer displays yet more logs, in fact there is a whole new world under ‘Application and Service Logs’. 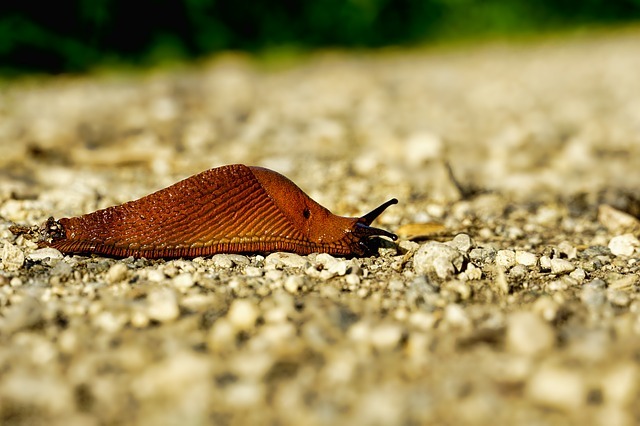 Operational:Like the Admin logs, the operational logs are also useful for discovering what happened to faulty print devices, for example, why has a printer disappeared from the network. See more on troubleshooting your Windows 8 printer problem. My aim in this section is to give you specific examples of what you can achieve with the Windows 8 Event Viewer. 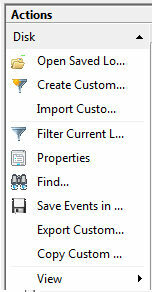 Custom views for events reinforces techniques you may have learnt in the Windows Explorer Searches, both create virtual folders of just the filtered information that you need. Incidentally, both use XML to organize their data. Firstly, before you create any subscriptions start the Windows Event Collection Service. In my opinion, the biggest problem with previous Windows event viewers is that when the computer did not do what they want, people, including me, forgot to search the logs for clues. The bottom line was that XP’s event viewer was not sufficiently eye-catching, interesting or useful to hold a troubleshooter’s attention. Windows 8 rectifies this fault by developing the event viewer into a console, where it’s easy and enjoyable to discover what is, or is not, going on under the covers of your machine. 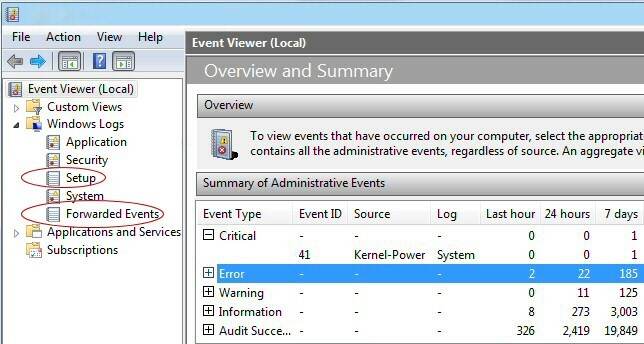 Caution: Don’t be tempted to turn off the Event Viewer, my friend ‘Mad’ Mick was trying to speed up one of his gaming machines by disabling the Windows Event log service. He swears that the blue screen of death that occured half an hour later was just a coincidence. I beg to differ. # PowerShell script to list the Windows 8 event logs. Note 1: -ListLog *. This displays a mind-boggling list of logs and not just log entries! Remember, there is a separate parameter called -LogName. Note 2: PowerShell helps me to learn more about the Event Viewer, and in turn, interrogating these logs is a great vehicle to learn more about PowerShell. 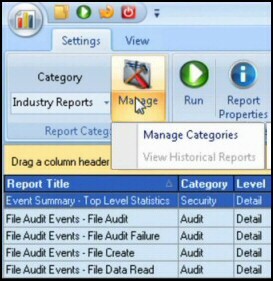 The Windows 8 Event Viewer provides 3 panes for you to examine a whole host of logs. In addition to the System and Application logs, you can see Hardware Events and records of activity from specific installed programs.